Due to popular demand The Diary of Anne Frank is back Wednesday 22nd May at 7.30pm. 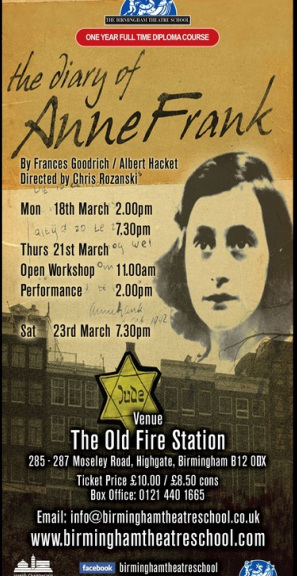 Join us for the last performance of The Diary of Anne Frank at this Gala evening. After a successful run this production finally draws to a close This final one off performance includes an after dark discussion with the opportunity to ask any questions about the staging and creation of this production. School groups are also welcome at a discounted group rate. Tickest cost £10 and £8.50 cons. For any information on this production please call our office on 0121 440 1665.